There have been few takers for GP training places in Nanjing. The city's community health centres need to recruit 110 family doctors to fill their positions but have only had 49 applicants. Under new health ministry regulations, all doctors including GPs must have the 5+3 education and training (5 years undergraduate and 3 years postgraduate.) However, despite offering a masters degree and a one month placement with GPs in Taiwan, most medical graduates have given the GP training scheme the cold shoulder. The reason is the low status and poor pay of 'community doctors'. After eight years training, GPs can expect to earn only about 80,000 yuan (US$13,000) a year, which is much lower than hospital-based specialists earn. Also there is no chance of promotion or career progression and GPs are expected to move around many clinics in suburbs and villages. 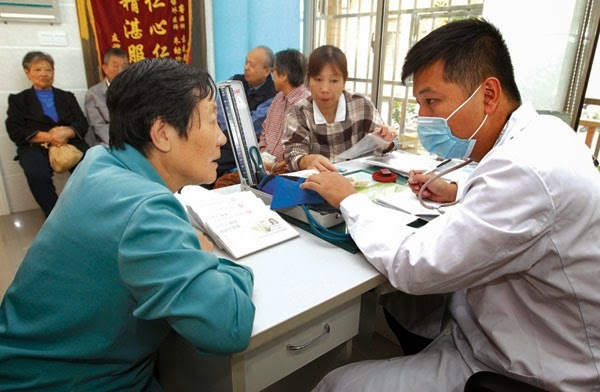 Health educators say the Chinese government needs to put more emphasis and resources into primary care if it is to develop a healthcare gatekeeper system similar to those used successfully in developed countries. Most of the 'research' published by China's doctors is rubbish and there's a simple reason for this - the publish-for-promotion system. To gain promotion (and often just to stay in the job) all China's doctors have to meet a certain quota of papers published in medical journals. The problem is that most of China's doctors are way too busy treating patients to be doing research and writing up papers. Many are simply not interested. The result is a thriving industry in academic fakery and plagiarism. It is common knowledge that doctors hire 'publishing agents' and ghostwriters to source the articles that will be published under their name. Ironically, many of the articles are written by medical students, and so there is an inverted system whereby the most knowledgeable and experienced clinicians are publishing articles written by the least knowledgeable. The going rate is about 3000-4000 yuan for a good paper - payment on publication, of course. Experts say the system has become a wasteful farce, and they are calling for reform of the one-size-fits-all quote system, to divide doctors into three categories: 'craftsmen' (no research, just treating patients), physicians (some research) and medical scientists (more research, fewer patients). The government says it expects to see a dramatic increase in uptake of private medical insurance before 2020, with new policies encouraging Chinese citizens to take out private cover. Ma Xiaowei, deputy head of the health ministry, the National Health and Family Planning Committee, told a news conference this week that the central and provincial government would "encourage the development of various types of commercial insurance to increase people's ability to deal with risks posed by major diseases." He said private cover was needed to help fund demand for health services, with the number of people over 60 already exceeding 200 million. However Mr Ma didn't explain how people will be enticed to take out private health insurance given that there are currently virtually no private doctors or hospitals and very few services or benefits from having insurance. Underpaid, overworked and under fire: that's the life of an emergency medicine specialist in Guizhou province, according to a Sina article this week. In China, emergency doctors accompany ambulances and are often first on the scene of trouble, even before police. One doctor said he often had to jump in and stop bleeding in stabbing victims while people were still fighting around him. Another said emergcny doctors were often faced with physical challenges such as getting critically ill patients down stairs of apartment blocks with no lifts. Emergency doctors said they worked 24 hour shifts then had a day off during which they mostly slept, and there was no time for leisure, holidays or study. The stress of daily life as an emergency doctor meant there were high rates of burnout - and doctors were considered grizzled veterans if they lasted three years, they said. In clinical news, new research shows that older Chinese are consuming more calories - and eating more unhealthy food - than their counterparts of the previous generation. A study from nine provinces found that the average daily energy intake had increased among older Chinese adults from 1379 total kilocalories in 1991 to 1463 kilocalories in 2009. The increases had come from greater consumption of high fat and high carbohydrate foods such as plant oil, wheat buns, and wheat noodles. 257,000 premature deaths related to PM2.5 pollution in 31 major Chinese cities. This made air pollution a major killer equivalent to smoking. Conditions such as lung cancer and stroke triggered by air pollution killed about 18,000 people in Beijing alone in 2013, the researchers said. And finally, a study from Shanghai as shown that the number of cervical cancer diagnoses in the city has increased six fold in the last decade. Data from 13,518 women with gynaecological cancers from 2003 to 2013 showed that the number of women with diagnosed gynaecological cancers increased by almost sixfold with the increase largely due to the increase of women with newly diagnosed cervical cancer. The study also showed that the age of diagnosis of cervical cancer had increased.